The QuickPanel+ (6", 7", 10", 12", and 15") integrates an HMI, logic engine, remote access solution, and an option to run an embedded data historian for improved real-time control of operations with better integration into plant-wide systems. 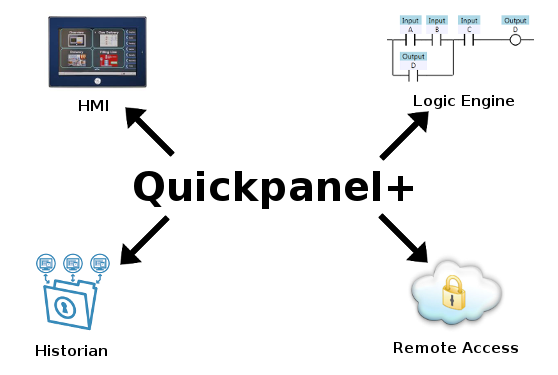 The QuickPanel+ elevates machine interfaces with new levels of productivitiy, insight, flexibility, and user experience. The QuickPanel+ simplifies VPN management with SiteManager networking technology, making it easy to access remote devices from anywhere in the world securely, without the need for complex networking, firewalls, and routing.